In this lesson, we will learn how to convert mixed numbers to decimals and solve real-world problems. Nader went running for hours. Express this mixed number as a decimal. 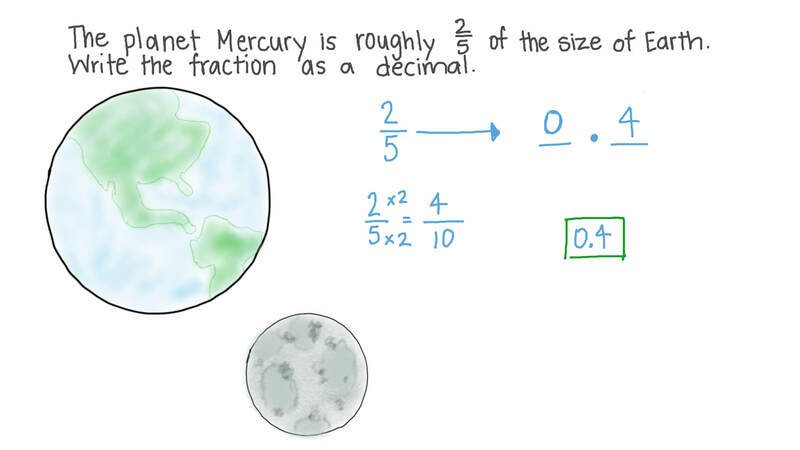 The planet Mercury is roughly 2 5 of the size of Earth. 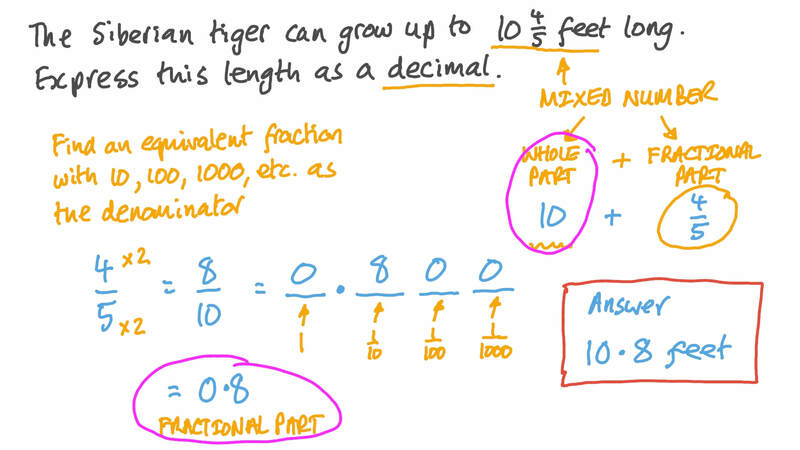 Write the fraction as a decimal. Calculate , rounding your answer to the nearest hundredth. Convert 7 1 2 to a decimal. The Siberian tiger can grow up to 1 0 4 5 feet long. Express this length as a decimal. In the United States, there are 7 8 7 5 0 Internet users per 100 people. Express the number of Internet users per 100 people as a decimal. Convert 6 4 1 5 to a decimal. Rancho Middle School has an average of 2 3 3 8 students per teacher. Write this fraction as a decimal. The table shows the wingspans of different birds. Name the bird that has the smallest minimum wingspan and the bird that has the greatest maximum wingspan, and give their wingspans in decimal form. Nabil completed a biking race in 5 hours and 54 minutes. 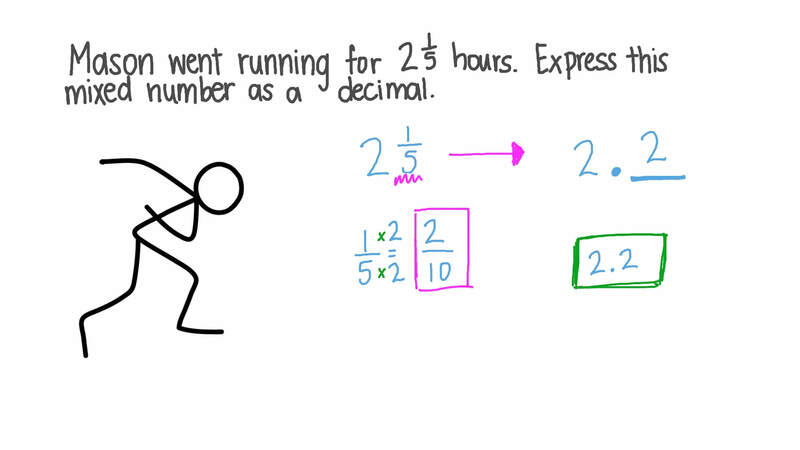 Express that duration as a decimal. Convert 9 4 9 2 6 9 1 0 0 0 to a decimal. Convert 96.32 to a proper fraction or a mixed number. At a party, people drank 27 bottles of soda. The soda bottles came in packs of 8. This makes 3 3 8 packs of soda bottles. Write that number as a decimal. Adam’s truck can carry up to 3.634 tons of sand. One day, he was asked to transport 3 9 1 6 tons. Will Adam be able to transport all the sand in one trip? Write 4 3 5 as a decimal.